I am already going into Big Love withdrawal. Although this current season hasn't been my favorite, it has had its moments. What I love most about the show is the INSANITY of it all. FLDS gives you so much foder. The more elaborate and mixed up in the compound it gets, the more beautiful and sinister the show becomes. Sister Wives! Nicki! Sincerely Yours, Hollis Green! Selma Green! Lois (before the writers gave her dementia)! Precious Adaleen! I am going to miss you so much. 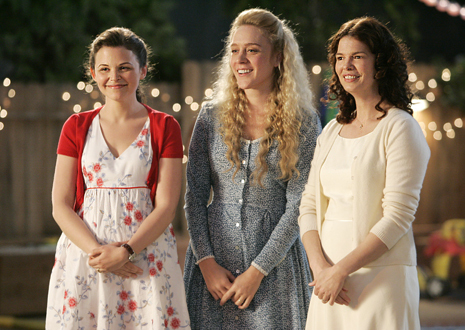 Jeanne Tripplehorn, Ginnifer Goodwin and Chloë Sevigny do such a good job. I want to be their sister wife, Bill Paxton on the side, please. The writing is AMAZING, but Nicki gets the best lines (by the way, whoever cast C.S. as a crazed fundamentalist polygamist deserves an award). Speaking of ZINGS, have you seen THIS?